Set in a conservation area in the pretty, historic village of Crich, this delightful cottage is ideally placed for walking and touring the spectacular Derbyshire countryside. 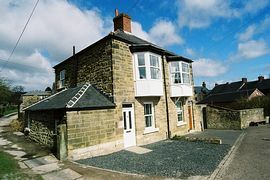 Newly renovated and totally refurbished throughout, this beautiful 19th Century Derbyshire stone cottage is spacious, immaculately presented and homely. 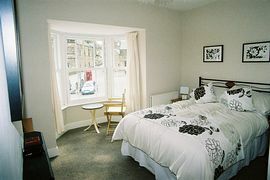 It has 3 lovely bedrooms, sleeping 4 or 5 guests comfortably. Many of the original features have been retained including an open stone fireplace with glowing log burning stove, cast iron feature fireplace in the master bedroom, tongue and groove latch doors and original Belfast sink. 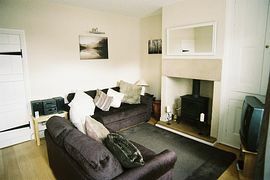 A warm, welcoming and cosy retreat all year round. Crich is a picturesque village with excellent local amenities on the doorstep including two well stocked grocery shops, "Cardale" fish and chip shop, "The Loaf" a wonderful bakery/cafe and a superb butcher's. Within 5 minutes walk, are four public houses serving real ale and good bar meals, and Crich Tea Rooms serving breakfasts and light lunches. Excellent amenities in a picturesque village. Ideally located for walking, cycling & family attractions. Ideal for a person with limited mobility as there is a single bedroom and family bathroom on the ground floor. Also the wide access back door leads onto a flat and even path and patio in the cottage garden. Enclosed cottage garden to the rear of the cottage with patio, bbq and garden furniture. Local Services: Crich is a very popular village with excellent amenties including a new Bakery with cafe, butchers, post office, grocery store and 2 shops. Take the A38 to Derby/Mansfield depending on which direction you are coming from. Come off the A38 slip road signposted Ripley/Nottingham, following the A610 towards Ambergate. Continue along the A610, passing the excavator pub on the left hand side and then the sign for Sawmills. Directly after this there is a right hand turn under the bridge towards Crich. Go straight on up the hill, passed Fritchley and along The Common, into the Market Place in Crich. Upon entering the Market Place, Mansion Cottage is directly facing you, two doors to the left of the hairdressers and can be identified by its white upstairs bay window.